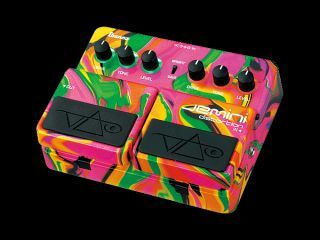 Ibanez has announced a new signature pedal, the Jemini, for enigmatic guitar virtuoso Steve Vai. The Jemini is a twin stompbox; a distortion with a Boss DS-1 distortion type sound is on one side, and an Ibanez TS9 sound is on the other. According to his website, it is Vai's intention to replace both of these pedals within his rig with the new Jemini. The Jemini is undoubtedly inspired by Vai's Ibanez JEM series - the early models of which, like the Jemini, featured a loud, multi-neon-coloured finish. The pedal is housed in a robust zinc casing and features bright LEDs, which Ibanez claims let you see whether the effects are engaged even in daylight. The controls are the standard drive, level and tone for each pedal, but Ibanez has not yet revealed details on how (if at all) the two circuits interact. The Jemini is released in January 2008, with an RRP of $285.